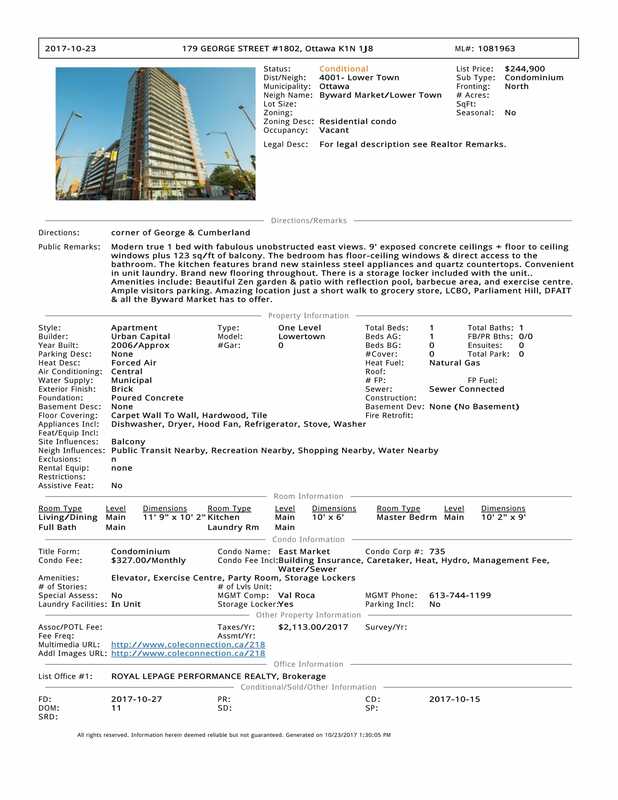 Modern true 1 bed with fabulous unobstructed east views. 9' exposed concrete ceilings + floor to ceiling windows plus 123 sq/ft of balcony. The bedroom has floor-ceiling windows & direct access to the bathroom. The kitchen features brand new stainless steel appliances and quartz countertops. Convenient in unit laundry. Brand new flooring throughout. There is a storage locker included with the unit.. Amenities include: Beautiful Zen garden & patio with reflection pool, barbecue area, and exercise centre. Ample visitors parking. Amazing location just a short walk to grocery store, LCBO, Parliament Hill, DFAIT & all the Byward Market has to offer.